Beautiful Comfort Sleeper Sofa with memory foam mattress—patented design, no bars and no springs, the ultimate in sleeper sofa comfort and design. This wonderful new sofa and sleeper are the perfect perch to take in the incredible ocean views or the 42" Plasma-flat screen TV above the river rock gas fireplace. 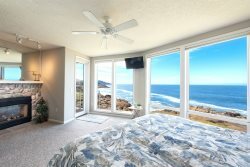 A great place for a family to stay and enjoy the coast. It was very comfortable and fit our needs well. We have enjoyed staying in Blue Pacific Vacation Rentals for at least 10 years. They are always luxurious and well stocked. Very nice room, always a wonderful time. One of our best vacation experiences.... the view, convenience, comfort level, and cleanliness. All of the employees I encountered were friendly and personable. There were a few things I needed to adjust over the phone and was met with efficiency and professionalism. We had a delightful visit with spectacular views, cool ocean breezes, and proximity to activities up and down the coast. We most loved the balcony and jacuzzi overlooking the ocean. Having a full kitchen available helped us save money and have everyone's favorite foods and beverages on hand. Having a delicious dinner ready in the crockpot after returning from a long day sightseeing was priceless. We spent mornings walking the length of the beach along the waters edge, days sightseeing along the coast, evenings playing cards and board games with family, and finished each night watching the sunset from the jacuzzi and balcony. Thank you for taking care of the details which allowed us to concentrate on the relationships and making memories. All around great unit and a great time. great property! would stay again! !